This two bedroom lodge is located on the new lodge development at Westhayes Caravan Park the development is nearing completion with a third of the units already sold. It is situated on a very large end plot which benefits from raised flower beds and Tarmac parking. The lodge is clad in Sierra can excel with golden oak UPVC double glazing and also benefits from central heating controlled by an efficient condensing boiler. 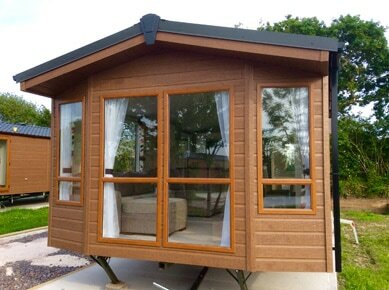 This lodge will have delivery, connection, siting, outside tap and electric point, digital arial, caravan skirt and very large side UPVC balcony in matching golden oak included in the price. The holiday home itself is bright and airy with plenty of Windows to allow the light in. The design is modern and bright, it has comfortable lounge seating, foot stool, coffee table and modern tv and Fire fitments. The kitchen is well equipped with gas oven and hob, microwave and a fridge freezer. There is a free standing dining suite adjacent to a wall unit with glass shelves. Along the hallway you will find a shower room which is light and bright and well equipped. Opposite is a twin bedroom and then at the rear is a large master bedroom with ample wardrobe space and en-suite facilities. Overall this lodge has lots to offer and all that is required to enjoy a break away in the beautiful Devon countryside. The lodge is located on a large plot with lovely views out across the fields.